Top rated and affordable Megaflo service engineers in Leicester. Installation, supply and service of unvented hot water pressurised systems. Megaflo provides a much better flow of hot water for a large house. At Subs Plumbing and Heating we supply, install, service and maintain unvented hot water systems. We chiefly recommend MegaFlo pressurised cylinder installations if you are having a new system fitted. However, if you require another brand or you supply the system then we can and have fitted many other systems. Unvented cylinders work by taking water directly from the mains water supply. This gives a high pressure flow of water. An immersion heater then heats the water and can also be run from an existing boiler. You’ll no longer have need for a cold water storage tank and gravity is not needed to assist the flow of water so your unvented system can be put anywhere that is convenient in your home. 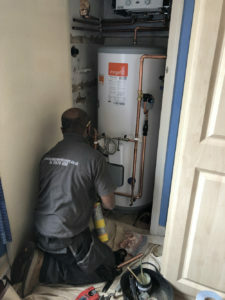 At Subs Plumbing and Heating, you will benefit from experts who are fully qualified and Gas Safe registered, as well as a great customer service experience. We’re proud to keep Leicester’s plumbing networks running great, whether they’re domestic or business properties. Contact our team today to find out more about any of our plumbing and heating services. We’re the number one heating specialists in all LE postcode areas, including Broughton Astley, Cosby, Loughborough, Wigston, Market Harborough and Shepshed. Get in touch and we will be happy to answer your query.